Many people flock to wooded areas each spring in search of the morel. 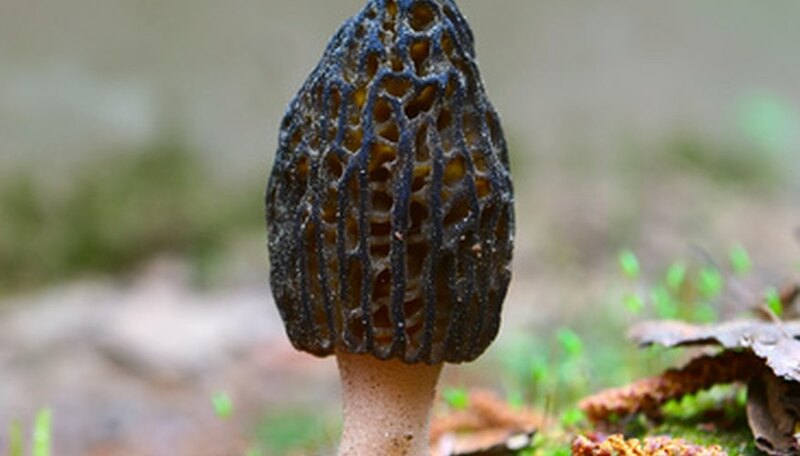 The morchella esculenta, or morel, is a wild mushroom that is found mainly in the upper regions of the United States such as Michigan, Indiana and Wisconsin, although they can be found in almost any region except deserts and ocean coastlines. The morel has a mild nutty flavor with minimal aftertaste. It is light on the palate and a welcome addition to many meals such as steak, eggs, sauces and salads. Most morels can be found in wooded areas. Trees provide shade and keep moisture in--two conditions that morels thrive in. Morels rely on shade to keep them moist so they can grow—sometimes up to several inches tall. Areas where there are fallen trees, hollowed out tree trunks, large branches and moss beds are where morels or morel clusters could be hiding. There are certain trees that morels tend to grow near or under because of the high amount of organic manner found in the nearby soil. These trees include elm, aspen, apple, poplar and sometime white birch. When hunting morels around trees, be sure to bring a long sturdy stick along. Use the stick to gently lift away leaves, sticks and other forest items away from the tree. Look for the head of the morel. They are tricky to see because they often blend in with the discolored leaves and branches. Colors include black, gray and yellow or gold. Morels can also be found in areas where water is nearby. They are a fungus and they grow well in damp, moist locations. Although they don’t grow right next to water or in it, they can often be found very close by, such as around a group of trees or fallen timber near a stream or river. Hemlock and cedar swamp areas often have an abundance of morels. Morels don't grow well in dry, clay or sandy soils; they thrive in moist, dark, nutrient-rich soil. The richer the soil is, the more likely you will find a group of morel mushrooms. They can also be found in areas of new growth such as areas affected by forest fires that haven’t yet been cleared out. The nutrients and fallen timber create good breeding grounds for morel spores that have survived the devastation. Temperature is an important part of the morel habitat. When temperatures start to rise above 60 degrees, most morels begin to rise up through the soil. Morels begin to make an appearance in southern states as early as February. They are not as abundant in most southern areas where the ground does not freeze over for the winter. In the northern half of the United States, late March and early April bring about warm temperatures that create a moisture blanket with the cool ground. This allows the mushrooms to flourish.